Beret, pronounced "Beray" is a French word for 'cap', it is a brimless loose-fitting hat which originated in the Basque region during the 19th century. The traditional Basque or French Beret which is depicted as the Bohemian artists headwear was of varying colours and usually had a leather headband. The felt crown was quite loose fitting and was finished with a small button in the centre. 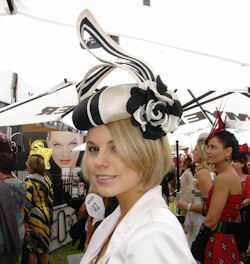 The favoured angle to wear this hat was often pulled to one side to give that chic but casual look. History shows that the first wearers of this style of hat were poor French farmers and Basque shepherds, but as time went on they became popular, especially in the early 20th century, with the Bohemian French culture, and it is not uncommon to see French artists of today be identified in a similar way. Over the years, many different versions appeared, including the oversized Tam-O-Shanter which was very fashionable between 1970-1980's and was also common headwear for the Scottish and Irish kilt wearers, especially bagpipe players. The styles varied as did the number of panels used to create the round shape of the crown. Most common is either six or eight panels. The Millitary in many countries use this style of hat as part of their combat uniform, and we are seeing on our TY News reports right now, the soldiers at war in the Middle-East wearing the felt style. During the 1960s, the beret enjoyed a come back as a fashion item for women when it was featured prominently as Faye Dunaway's hat of choice in the film "Bonnie and Clyde". Over time, this style of hat has been one of the most popular, and it's popularity has spanned over several dacades, especially for casual wearing by females. I believe it could be because of the ease of wearing and storing. It is a soft type of hat that can be stored with minimal fuss. so much so, that it could be stuffed into your handbag if the hat is not worn for the total duration of an outing. Some are often made from wool and blocked into a flat circular shape with a second layer forming the lower half and allowing the headline to fit the head. These are soft enough to be pushed and pulled to any preferable angle to suit the shape of the face. They are made from fabrics of all types, and no matter what fabric, can be worn in the same manner. A slightly more rigid version can be made from rabbit fur felt or a wool fur felt hood or capeline, as it can be blocked into a similar shape and is still referred to as a beret. Its rigidity can vary, as well, and the more sizing or stiffener applied to the hat, the less flexible it would be, leaving it less flexible and would not tolerate being squashed into the handbag. The straw hats pictured on this page are blocked from Parisisal straw and stiffened into shape, but while they are not strictly a traditional beret and could easily be called a Pillbox, they are sometimes referred to as that name.